The scrappy Christmas Tree Quilt is finished! I’m just making the label to stitch on the back. I’ve actually made two tops. This one has mitered borders, and the other has the piano key/rail fence pieced outer border. I’ve only quilted the one, so far. The star and gifts are machine embroidery, and the garland is hand embroidered with gold ribbon floss. This will be one of the items that I have for sale at the Toronto East Rotary Club Arts and Crafts Sale this Saturday (Nov. 17th) at Eastminster United Church on Danforth Ave. in Toronto. This week will be busy finishing off projects for the show. 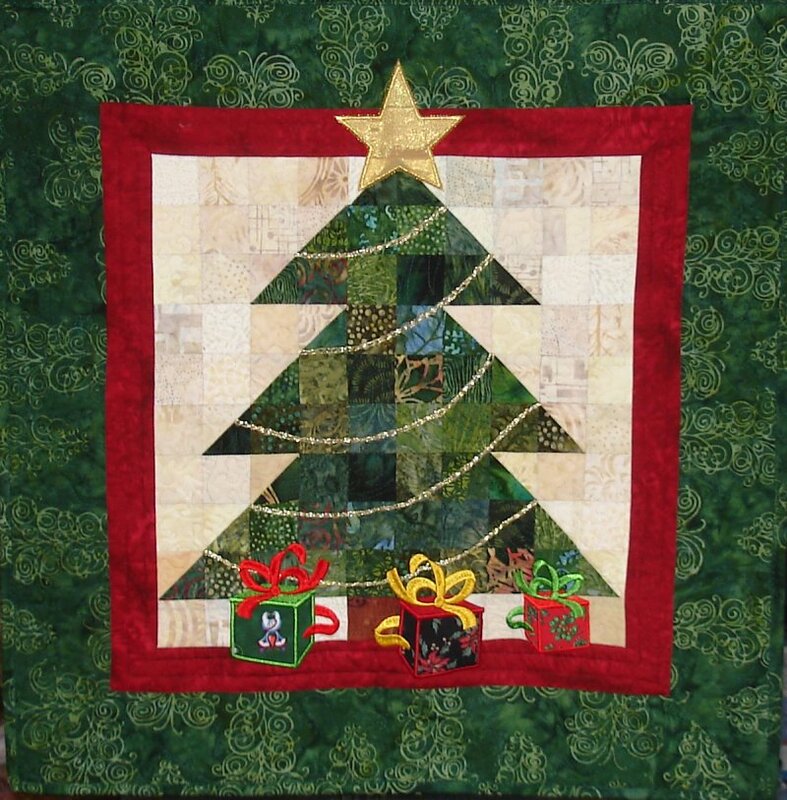 I’m not sure if I’ll have time to finish the second scrappy tree quilt for the show, but if not, I’ll have a new quilt to hang in my hall this Christmas season! This entry was posted in Free Motion Quilting, Quilting, Uncategorized and tagged Toronto East Rotary Club Craft Sale. Bookmark the permalink. Love it!!! Maybe I can make one too for this Christmas! Since it’s just squares and half square triangles, the top went together quickly. I also used a gridded fusible interfacing to put it together. You iron the squares to the interfacing using the gridded lines to keep everything straight then turn it over and stitch 1/4″ seams in one direction. Clip the interfacing between the squares, and stitch the seams in the opposite direction.